On rainy days when I was small, my grandmother — I called her Nana Banana – always let me build a fort indoors. She carried her tall kitchen stools out to the living room and fetched the biggest blanket from her cedar chest, which was perched on round feet in the shape of lion’s paws. The blanket was heavy red wool, hemmed on all four sides with shiny satin. Nana Banana had brought the blanket with her from Up North when she moved to Florida, and it was very, very thick and warm. Nana’s wooden stools had flowers and birds carved down the legs, and squeaky cane seats that had been woven by her very own grandfather. The blanket and stools were perfect for forts. First, I always drew my map. I loved to decide where to build the fort. The furniture had to be all figured out and labeled. Sometimes the couch would be the mountains, other times it would be the forest — or, it might be I was in a big city and the couch was the library or the post office. The shiny coffee table could be the ocean, or a lake, or maybe the zoo. I would crumple up my map and smooth it out and Nana would singe around the edges with a match to make it look old. Then I would go to the building site and lay out the fort’s foundation, which was four stools, one for each corner. Nana would pick up two corners of the blanket and I would pick up the other two. We would billow the blanket up as high as we could and let it float down. It draped beautifully, like an Arabian tent. I would crawl inside, and underneath the dense red blanket it was dark and quiet and far away from everything. From that place I could go anywhere in the whole world — or, I could stay right where I was if I didn’t feel like traveling. If I wanted to fly, Nana would make plane noises. If I wanted to sail, she would be the water and wind. Always, she was there to help me get to where I wanted to go. Later, if I crawled out of the fort and needed to buy something, she was the shopkeeper; if I wanted to sell something, she would be the customer. It seemed like I could always talk her into buying — no matter what it was I had for sale! Sometimes, though, when I was tired and cross and just wanted to be by myself, I would take a flashlight into the fort and read. I had pillows and sofa cushions inside so I could be comfortable. Nobody would bother me under there — they’d act like they didn’t even know where I was. On days like that, sooner or later Nana Banana would silently push a bowl of popcorn or a plate of cookies through my door. The whole world shrank down to that warm, dark space underneath Nana’s red blanket; under there, because of her and how much she believed in me, I just knew I was the smartest, bravest, most important person ever born. But the best feeling of all on those long, stormy afternoons was when the rain finally finished — and I realized I was ready to leave my retreat and go back to the bright, quick, noisy life outside. Dinner that night would taste so delicious! Please, tell me, tell me! 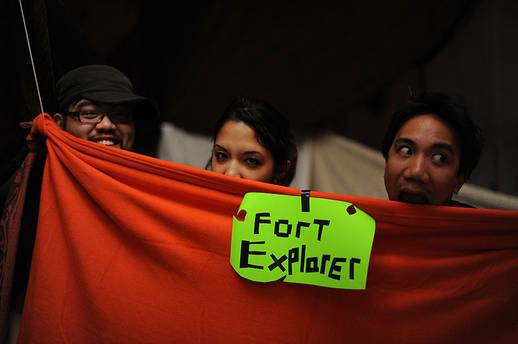 Where will you build a fort, next time it rains? Once inside, where will you travel? you really have a very good memories of your past big sister 😀 I imagining the days that you been through and looks very very fun. Not all of us had a secure red blanket, some of us were left out in the rain. my nana would have totally given you hers. she could make up for a lot of rain. and there was plenty of rain in my life, too. when she wasn’t there. I would probably have stayed there, like you did sometimes…or maybe go to Saudi Arabia…maybe. sometimes even now i want to go back there. poor baby! I’ll find a new red blanket for you…your nana was amazing!!!! So are you !!! Hi, Kimberly! Thanks for your recent comment here: http://www.uww-adr.com/blog/florida-mediator-discusses-importance-of-punctuation. WE looked you up, and we love you back.